After one or two trips around the city it became obvious that if I needed to change my style of driving if I didn't want to be ground into the pavement. While the highest speed limit is only 80km per hour (about 5omph) however the twists and turns of the road threaten your safety even at this speed (which is still rarely followed). On this serpentining roadway cars dart across lanes haphazardly, a 15 minutes drive could take up to an hour and a half, and lanes no longer hold any meaning; in fact following the lanes can be hazardous to your health. On one highway, the Carril Express, on certain segments of the highway, there are two sets of lines painted on the ground. To this day I'm not sure which one I should follow, but whenever I see them I make sure to frantically look around to see which ones everyone else is using. Before you step foot in a car, the city officials should give you a specialized pamphlet about driving in Monterrey. I imagine it would contain some of the following rules: stop signs mean slow down a bit, yield signs might as well not even exist, speed limit signs are less of a limit and more of a suggestion. The driving here is indeed a bit dangerous, but one method of survival I've adopted is the frequent use of my hazard lights. Hazard lights will save your life. Let me repeat that with more emphasis. Hazard lights will save your life. Just a few days ago I was driving through a tunnel (Tunnel Loma Larga) when the car in front of me came to a rapid halt and turned on its hazard lights. Instinctively I did the same as I slammed on the break. Behind me was the screech of burning rubber and more flashing lights. In Monterrey the break light doesn't mean that you're stopping, it just means you're slowing down. Hazard lights are a way of saying, "HEY THERE IS SOMETHING IN FRONT OF ME AND I HAVE TO STOP!" But let me assure you of something. You are probably going to be in a car accident if you drive here. There are hundreds of reported car accidents in the city every day (make sure to note the word reported). It's become something of a daily ritual to ogle at the pair of cars smashed into each other on the highway; and they are always on the highway. Drivers are not allowed (by law) to move their cars after a car accident. This leads to some pretty tricky situation. Believe me this happens every day in Monterrey, there are hundreds car accidents a day. On one choice encounter I sat in a traffic jam for 2 hours. I couldn't figure out what was going on. It was on a 3 lane highway, and generally one of the fastest highways in Monterrey. As I approached the bottleneck I was amazed. There had been a car accident that left one car blocking the left lane, and another car blocking the right lane leaving only the middle lane open for traffic to pass through. 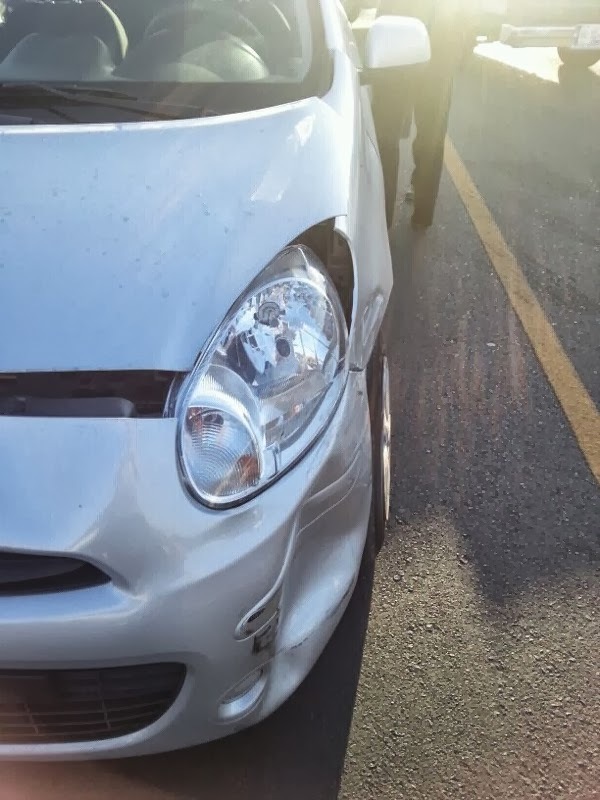 As I pushed my way though I looked at the two poor souls responsible for the accident and wondered how long it would take the insurance agents, who are required to come look at accidents, and the police to get to the scene of the accident. 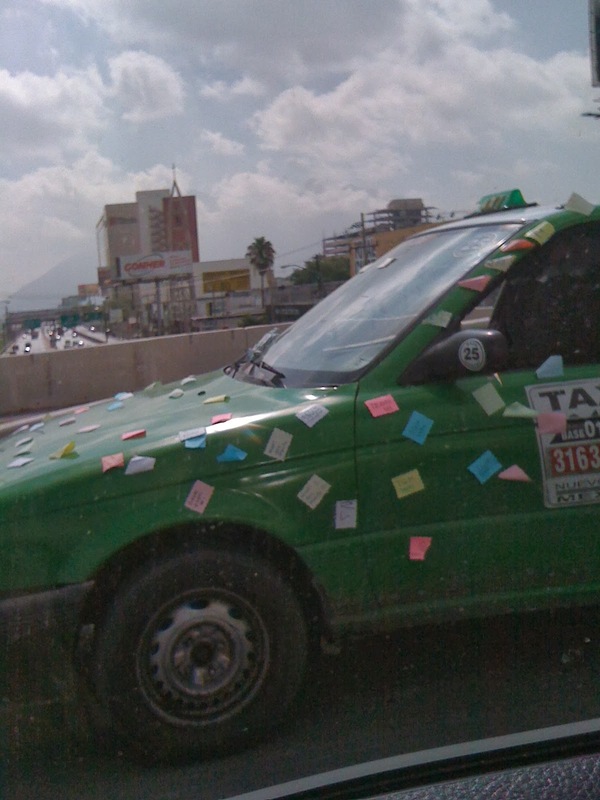 Getting used to traffic in Monterrey is one thing, but the police in Monterrey are another thing altogether. I remember the first time I got pulled over. I was driving, minding my own business when a police officers lights turned on and I pulled over to the side of the road. This was the wrong decision. Police lights in Monterrey don't mean pull over. They mean we want to make you feel nervous so we can pull you over. I was reprimanded by my South American friends for the amateur decision as the officer strode up beside my car and took my license and registration. Soon the officer was telling me I had a "problem" (note the quotation marks). This was one of my fluent friends took over and after some fast exchanges we were off and driving back home. That is until we were stopped a second time at a police barricade. Looks like it's this guys birthday! While I've painted a negative picture so far, driving in Monterrey is not without its charm. Once, as I drove to the grocery store, I witnessed a car changing lanes and almost sideswiping another car. I saw an arm raise out of the assaulted car's window and instead of the middle finger I was expecting the hand had the middle and ring fingers pressed down by the thumb, the rock on sign. There are good and bad parts about driving in Monterrey, but that's how driving anywhere is, whether it's in Mexico, Idaho, or China. Really the only important thing is that you get from point A to point B!